At the mouth of Burrard Inlet, these trails offer awe-inspiring views of downtown Vancouver, Stanley Park, English Bay and Bowen Island. Easy on the eyes and the legs. Don’t miss the namesake 1912 Point Atkinson Lighthouse. Huff and puff up Mother Nature’s 853-metre StairMaster, and you’ll be rewarded with a panoramic view of the city – and frosty pints. Don’t forget to Facebrag your best time. You know this one’s a classic: It’s named after the founder of the Scouts. 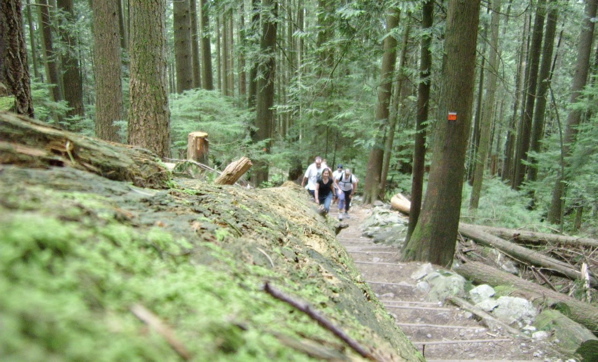 Enter this trail at Mount Seymour Provincial Park, and trek all the way from Horseshoe Bay to Deep Cove. Located within the Endowment Lands, 50 kilometres of trails meander through lush rainforest and deep ravines before opening up to the ocean and the Fraser River. Off-leash zones abound. Take the main Capilano Pacific Trail to feel the rush of the river, or opt for one of the shorter trails that lead to the salmon hatchery. Catch vertigo-inducing views of the canyon and the Cleveland Dam on the Second Canyon Viewpoint Trail. Image courtesy of joneboi on Flickr.